To badly misquote Shakespeare, now is the summer of our plants’ discontent. All of a sudden, everything that can happen to a plant is happening to a plant. So for my next few series of posts, I’ll address that, and how I’m dealing (or not, in some cases) with that. Sorry–this is much blurrier than I’d realized. The worm is green and the base of the purple flower. There’s a better photo below. 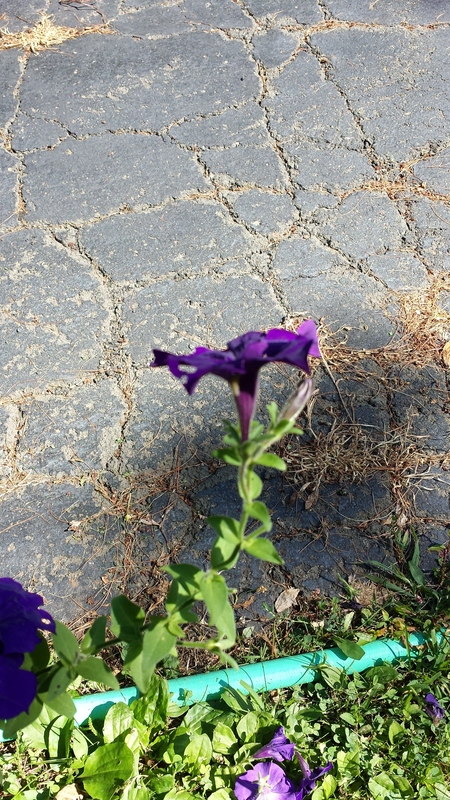 This past weekend, when I wasn’t badly lamenting the Spoiler’s complete disregard for my organic principles and disregard for our wildlife, I happened to notice some chewed petunia flowers. I knew immediately what the problem was, although it is a little bit tardy. It must be the weather. 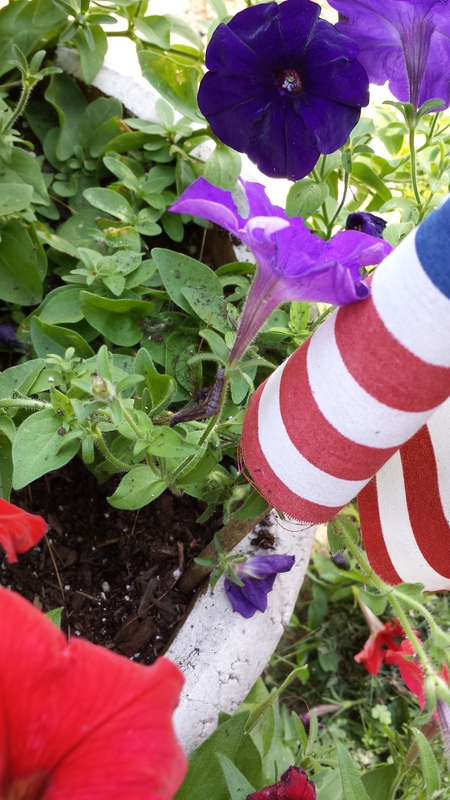 Petunia worms–other wise known as the tobacco budworm–will grow into a nondescript brown moth. They can be quite destructive, however, because the caterpillar feeds for about a month. It is also not particularly selective. It loves petunias, but it also loves geraniums, flowering tobacco (otherwise known as nicotiana), and occasionally some other garden annuals as well. If you overwinter your annuals like geraniums, you can overwinter the “problem” of eggs in the soil. Needless to say, with this fascination, I did nothing except hose off the plants. That’s not terribly effective. I will go out with some bT to try to control this infestation. My plants are looking great and I’d like to keep them that way. If you don’t happen to have any bT, I’ve also had great luck with insecticidal soap. They’re just soft-bodied creatures after all. And if you just have a couple, hand-picking works too, if you have the time and the patience. But if you do nothing, the worms will grow bigger and the petunias will stop blooming. And that’s not a great result on any front.